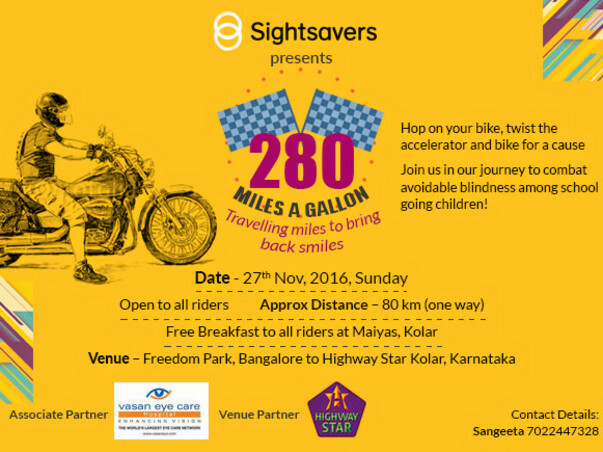 “280 Miles a Gallon” is a sensitisation awareness campaign involving Bikers of Bangalore. 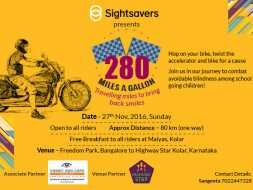 This campaign is an initiative of Sightsavers. The aim of this event is to promote the importance of eye care and prevent children residing in impoverished regions from going blind due to refractive error. We believe the participants in this event understand and support the society along with their passion for bikes, long-rides, adventure, fun and companionship etc. These riders aim to have a constant and strong mechanism to aid charity in different aspects, the most important one being to fulfill the responsibility as responsible citizens. Through this event, we wish to promote the importance of eye care and prevent children residing in impoverished regions from going blind due to refractive error. Children in the school age group (5 – 15 years) are vulnerable to long term consequences of eye diseases if not detected and treated early. During the financial year 2014-15, NPCB had planned to provide spectacles to 900,000 school children through its school eye health programme. Considering the number of school children in the country, and the fact that 121 million children of the total children are enrolled in Government schools, this target is inadequate as the total number of children requiring spectacles is 4.9 million (based on a study of refractive error in children in a rural population in India conducted in 2014). In short, approximately 80% of children are deprived of benefits from quality eye health services. Since, it will be a fundraising event all the funds raised from this event shall go towards providing glasses to school going children under our school eye health programme implemented in 6 districts of India. Details of which will be mentioned in our Annual Report and also on our website. We will also encourage participants to raise funds on our behalf. Open for all riders !! 11:05 to 11:15 – Thank you note & Execution of the event. Note: We are taking a minimum amount of Rs 499 towards registration. A portion of the revenue generated for the event will go to supporting Sightsavers' School Eye Health Programme. The registration fee includes participation charges along with breakfast at Maiyas, Bangalore. Thank you so much for your contribution. We would like to thank each one of you for helping us with this worthy cause. We would utilizing the money for providing glasses to school going children under our school eye health program implemented in 6 districts of India. We once again thank everyone for supporting us.